I'm up to my eyeballs in hurricane-refugee animals, and one day I get to my office and find a large box awaiting me. Upon opening said box, what do I find but a large selection of soft, warm cage cozies destined for those very same displaced pets. Even though I had not yet requested cozies, considering the fact that the refugee animals are cooled only by fans and it is still hot enough here in South Louisiana to bake oatmeal cookies in your car, I was still extremely cheered to open this box full of bright, warm, snuggly things. And, serendipitously, these arrived in time to be put to use right away as some of the hurricane animals go home with their owners as they find new places to live, so they will have their very own warm, snuggly thing to curl up on and a spot to call their own. 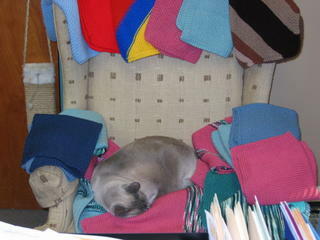 Here is "Blue," an elderly Siamese cat, test-snuggling the cage cozies before they are distributed to animals in need. Yes, he is dimensionally challenged, and he does resemble a harbor seal, but I promise you he is really a blue-point Siamese. Being a homeless cat himself, Blue heartily endorses these cozies to go home with the refugee animals from Hurricanes Katrina and Rita. With me being a helpless sucker for old-geezer gatos, Blue had the run of my office until he was adopted the day after this picture was taken. A million thanks, purrs and tail-wags to Jean Anderson of New Jersey, the maker of all these cozy objects, who had planned to donate them to her local shelter when winter arrived, but decided instead that the hurricane refugee animals needed them more. Which brings me back to something approaching normal -- the subject of knitting. It's about time for those cage cozies you kind knitters offered to send, for the animals as their owner reclaim them. People are starting to find jobs and apartments, and many people are reclaiming their sheltered pets. Some lost pets are being reunited wit their families. And there are many who will remain unclaimed when the shelters close, and who will welcome warm, snuggly cozies as they move along to their new, adoptive homes. If you would like to send cozies you have already made, it's time to pack them up. If you would like to make a cozy, there is still time. Cozies must be machine washable and dryable, so use superwash wool, cotton or acrylic. Knit at a denser, firmer gauge than you would to get nice drape in a sweater. Cozies are supposed to feel like a pad. Plain old garter stitch is fast to knit and makes a nice, thick pad -- or you can practice your double knitting. This is a great way to use up scrap yarn oddments, or the yarn bestowed on you by friends and relatives who, with your very best interests at heart, thoughtfully pounce upon 55-gallon bags of weird-colored 1970s yarn for 25 cents at garage sales. Animals don't care if the colors are ugly (at least none have ever complained to me personally), provided they are warm and soft. Sizes: about 18" square (half a meter) for cats and small dogs; about 3 feet square (one meter) for bigger dogs. Each and every cozy will be paired up with an animal in need. Thanks again to everyone who has offered to send cozies for the animals. They will provide a welcome bit of comfort for confused animals in the midst of chaos. The relief efforts go on. Tomorrow, some New Orleans residents will be allowed back into specific areas which are safe to re-enter. I'm bracing myself for the day when I can take Mom back to see the house. Supposedly her part of town didn't take much water, and her house is an old house up off the ground, so we are keeping our fingers crossed. Off to bed. Tomorrow is another day. Glad Blue found a home - he was a real sweetie! Wish I could have taken him, but as you know, I had just increased our Meezer "Pride" to its full compliment of 3. Our Meezers truly love the snugglies that came home with them from Siamese Rescue. There just is no point in sending cozies from Australia, even if my age-worn left shoulder was up to it, but the whole of New Orleans has been in our thoughts. Impossible to imagine what it was really like. If you have a soft spot for ancient moggies, you really should come and meet Vegemite, who will be 19 in late November, actual date uncertain. She just turned up on our doorstep, a scrap of a kitten, in mid January.Age guessed at 8 weeks. Vegemite grew into a big strong confident cat with a silky coat between long and shorthair. A committed and dedicated hunter of wild rabbits (ate every one of 'em under our dining table). Simply the best personality and temperament - has never scratched anyone in anger. At her age she has seen a parade of dogs come and go (mainly Italian Greyhounds) and she has kept them firmly under her paw. Vegemite is that blacky-brown yeast spread that all Aussies are brought up on, and that exactly describes her colour. These days Veg is a tad stiff in her hind legs, and is deaf, but on the other hand her teeth are in perfect condition, only a little stained. Her 'cozy' is a sheepskin under a desk lamp. Her night time sleeping place is between my pillow and Ernst's. San Pedro, Calif LOS ANGELES -- It was in a stack of used books being sold for two dollars apiece outside a dusty museum of hollywood memorabilia. I have a pet bird supply site/blog. It pretty much covers pet bird supply related stuff.